As a cyclist, you are at risk of being involved in a road traffic collision. Unfortunately, because you're not afforded the same protection as car drivers, you have a higher chance of sustaining serious injury. If you've been involved in a cycling collision, you're likely to be frustrated because the collision was probably caused by the motorist who didn’t see you, pulled out in front of you, opened a car door into your path or cut you up on a roundabout. There are many reasons why accidents occur and, whilst nobody ever intends to cause an accident, they do happen. If an accident is caused by the fault and negligence of another, the injured victim is entitled to claim compensation. Every accident is different and each individual case is unique which is why we believe so much in personal service. We invest in our staff and staff training to ensure our clients get the best possible result. The team at Cycle Law Scotland has considerable experience and expertise in investigating a wide range of cycling accidents. Our team members regularly cycle to and from work so know first hand the type of accident situations which are common - and also those whch are unique to cyclists. Based on our own experiences, both on the road and representing clients, we have identified some of the more common accidents involving cyclists. 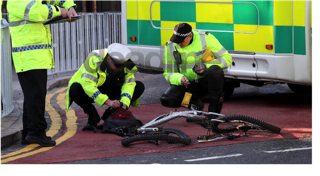 Learn more about common cycle accidents and how the team at Cycle Law Scotland can help.